The 1 Button BSTL audio kit comes with everything you need (apart from cable), kit includes 1 button front panel, Bell 61 amplifier, 801 audio handset, lock release, power supply and connection diagram. We have selected these kits as they have plenty of space in the front panel to make connections and are easy to wire up. All you need to add is BT or alarm cable to run to the handset, power supply and lock release and a plug top. 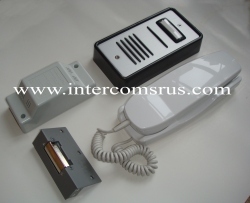 **Type : 5 Wire AC Electronic Call. **Panel Dimensions : L 19cm x W 10cm x H 3.8cm. **801 Handset Dimensions : L 22cm x W 7cm x H 6.5cm.